I didn't have a Uecker, now I do! 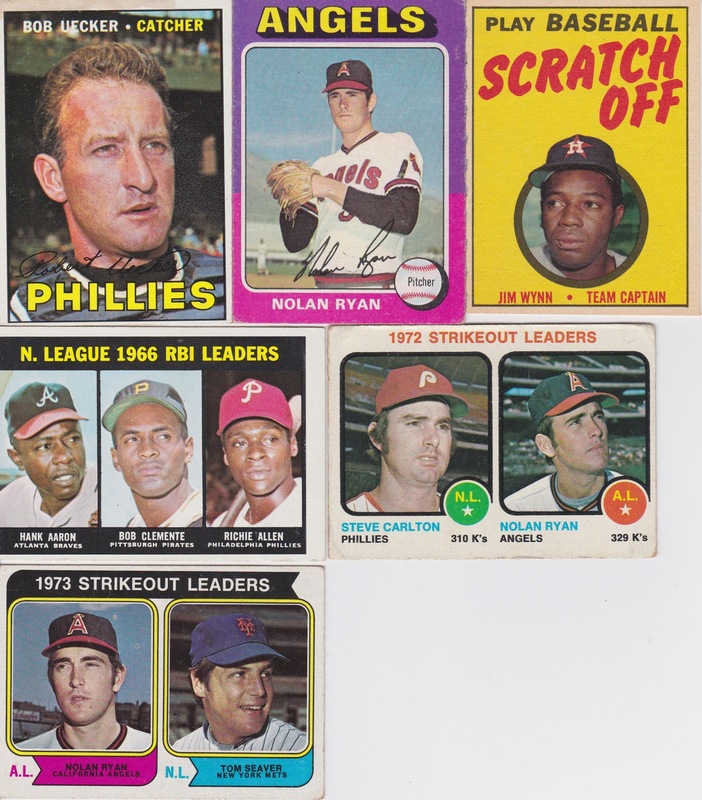 A few nice Nolan Ryans, a scary looking Jim Wynn.. and the jewel of the scan, an Aaron/Clemente/Allen league leaders card. I didn't have a "vintage" Clemente or Allen, now I do. Finally, some vintage Astros! 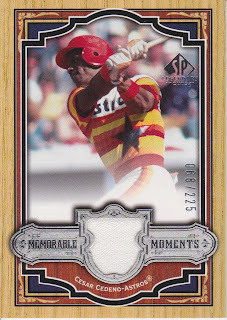 So what if I hate Joe Morgan, that card is awesome. 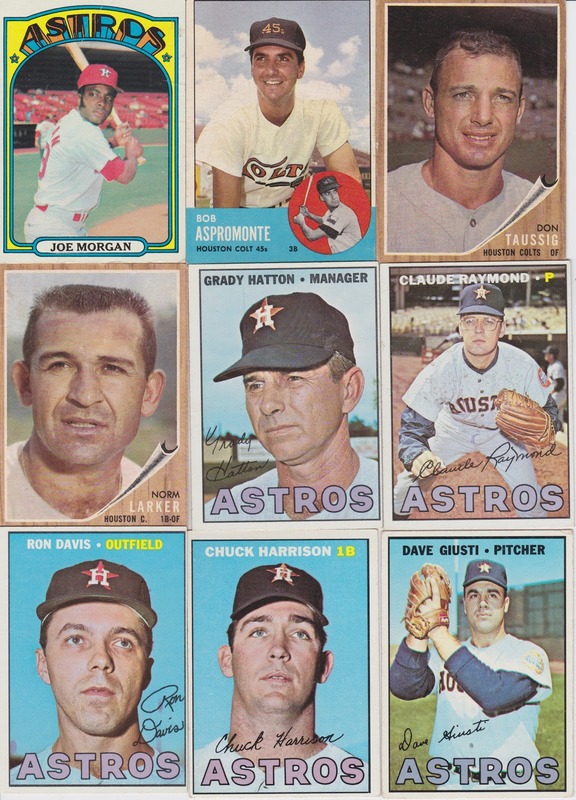 Love me some vintage looking Astros cards and Grady Hatton is a manager I don't think anyone messed with... he looks pretty pissed at the fact his photo was being taken. 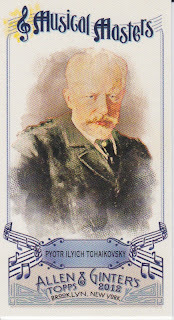 Tchaikovsky is more exciting than most of the baseball players that I got in this re-pack. Crazy, eh? It's a Musical Masters mini! 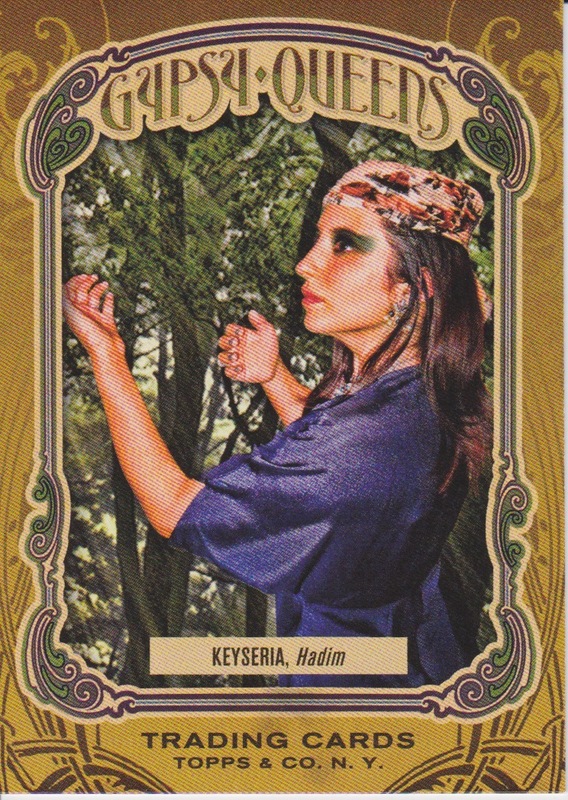 Ok, so I did get a cool card in the mail yesterday. I saw three of these pop up on eBay last week after literally not seeing a single one for 6+ months... so I snagged the one ending earliest just to get it done and over with... not too shabby, won it with a single bid. 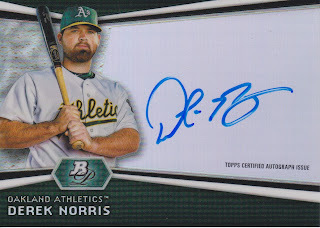 Not a lot of competition for this guy's auto I guess! 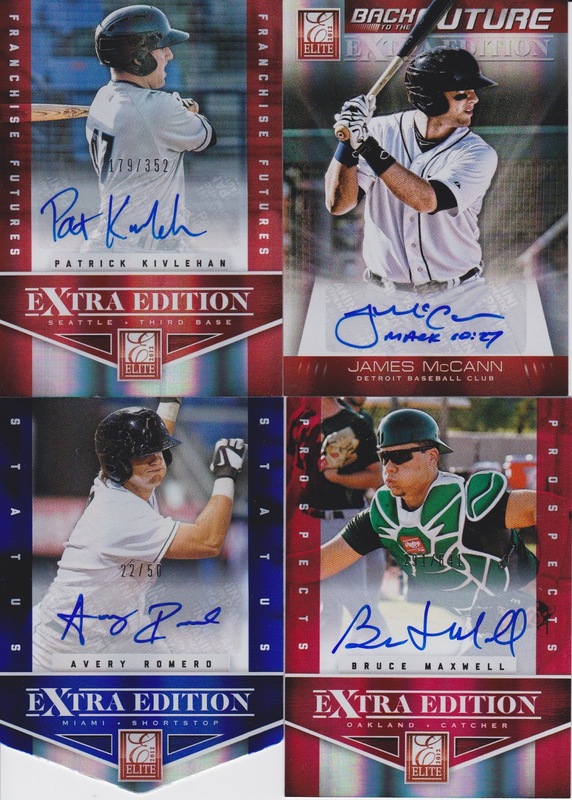 This leaves me with just 14 more autographs to get from this set... 29 down... seriously, if you have any GQ 2011 autos to spare that I don't already have, you will get the better part of any deal we put together! Hey guys, for those participating, I have the linked Spreadsheet showing the current status of who is "keeping" what, and who is "sharing" what as far as duplicates go... As I stated in the original e-mail that I sent to you guys, if I haven't heard from you then I've kept your name in the "keep" duplicates column until I hear from you otherwise. If anyone sees any errors in this table then please leave a comment or e-mail me to let me know what needs to be changed, I may have missed updating. Product goes live next week!!!! Next weekend should be a glorious 3 days of busting, collating and sorting! Can't wait! 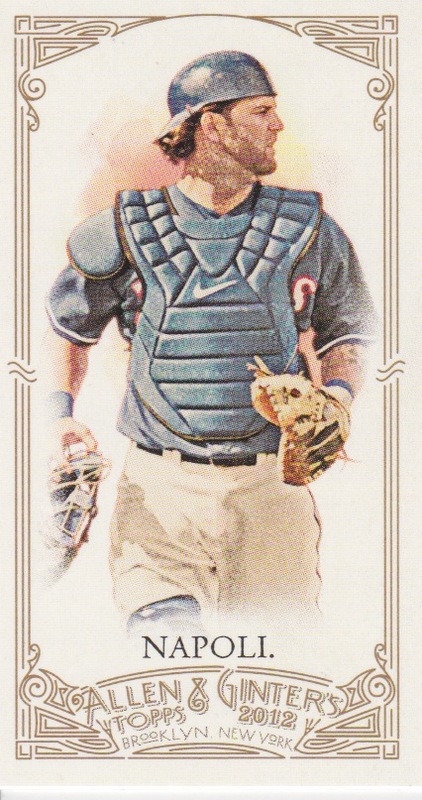 A sweet lookin' mini of Mike Napoli and with the A&G Shield on the back. This is #9 folks, the 9th best card (in my opinion) that I got from this re-pack. Does this adjust your expectations for these posts or what?!?!!? Aaron just looks awesome in the picture and I love the design on this one! Alright, moving along, tomorrow we'll have #9! 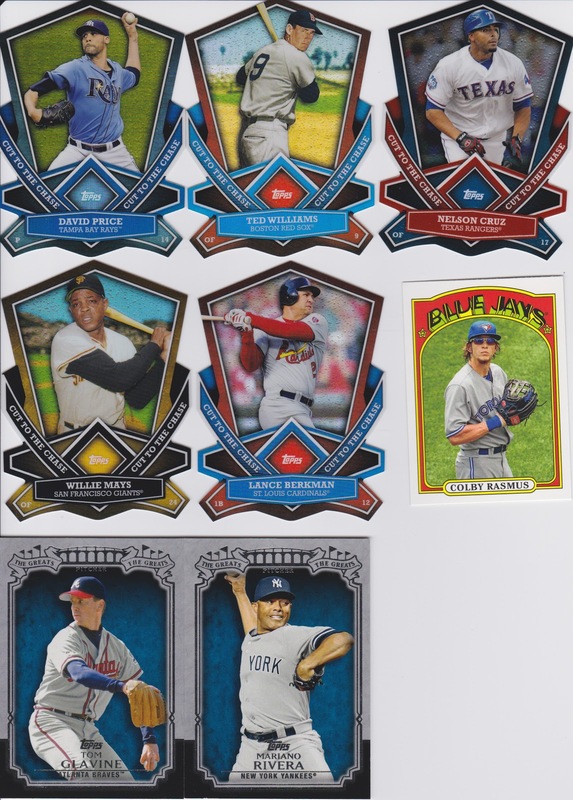 I picked up a couple cards from SportLots.com the other day... one finishes off my regular set of "Gypsy Queens" from 2011 Gypsy Queen and the other puts me within 5 cards of finishing off the "Tarot Card Back" Gypsy Queens from the same set! Sweet! 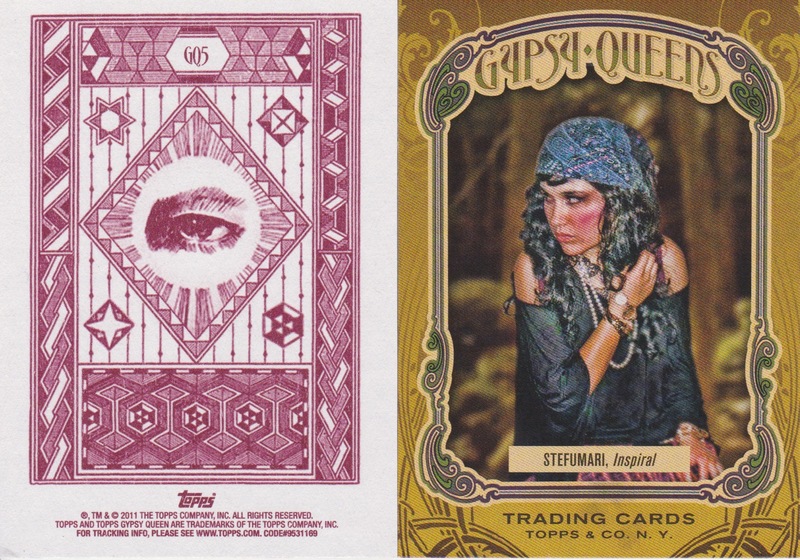 All I have left for 2011 Topps Gypsy Queen are 5 Tarot back Queens, 2 regular back mini's and 14 autos! How freakin' sweet is that? Oh, and big news is coming in the next 5-7 days... 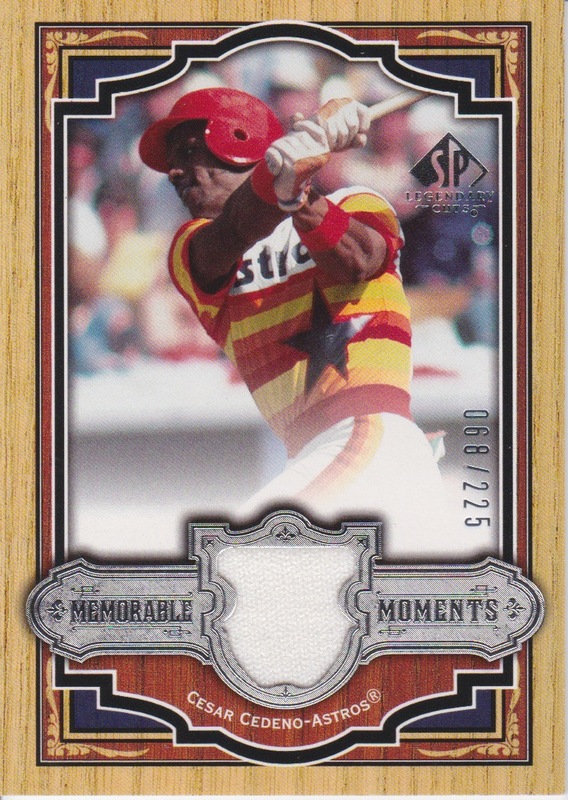 I've crossed off a major card from my all-time want list... a card I've wanted since I was a kid. A card I thought would always be out of my reach... well, it's on it's way and I can't wait for it to get here! 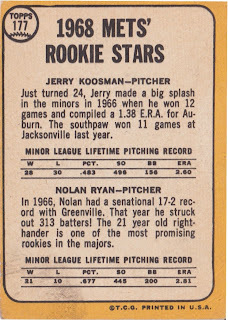 J.R. Richard would be sharing every one of Nolan Ryan's accolades if it weren't for the stroke that derailed his career. The guy was electric. Great auto! Love this card! Cesar Cedano, this guy was awesome. 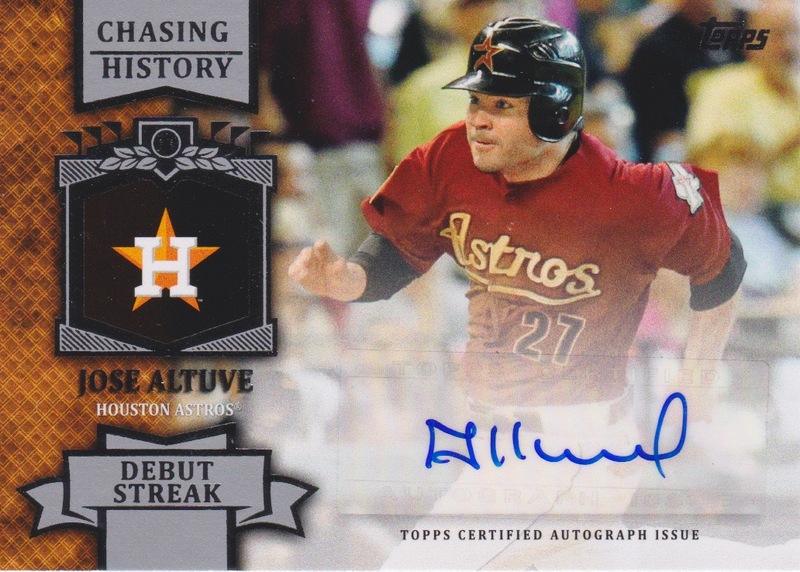 Glad to see he's back with the Astros this year in a development role. Well, that wraps up this COMC purchase! But no worries, I have another one coming down the line in a few weeks! Here's the video of busting the silver slate redemption pack from the February Group Break. Based on a lot of frustration lately, and my declining enjoyment in the hobby, I have decided to discontinue the monthly Daily Dimwit Group Breaks. Over the past few months, I’ve watched close friends and bloggers invest in my breaks, only to get little to nothing in return. I know that each break is a gamble, but I am just at the end of my rope. 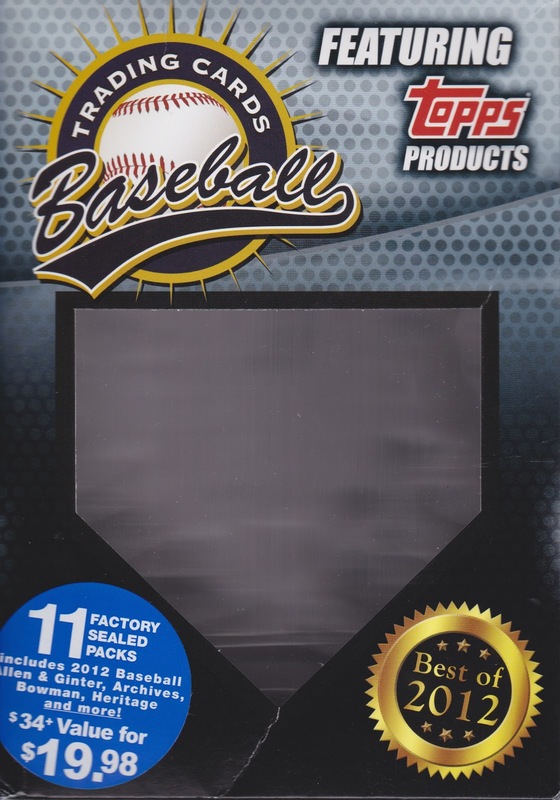 With the extension of the licensing agreement with Topps and MLBP, I feel that new and future products are not going to be equitable to all involved. 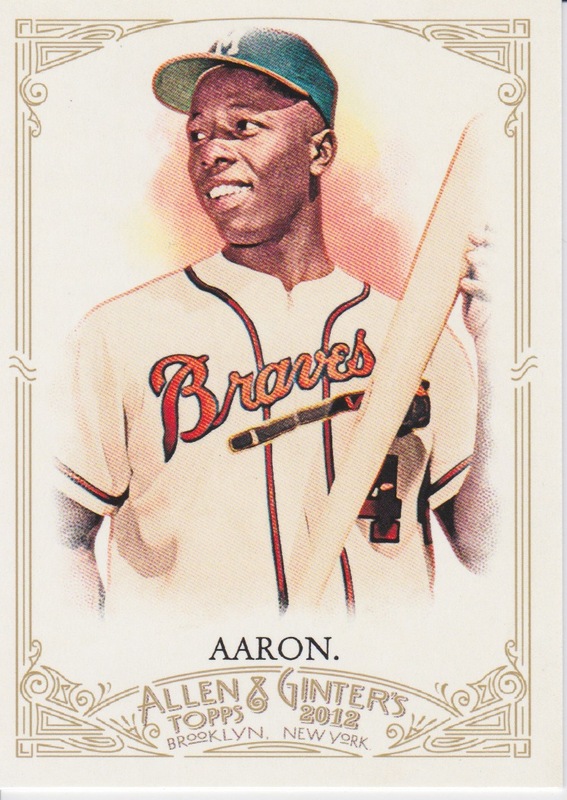 This may be a bit of a case of sour grapes, but I’m tired of seeing teams (like my Astros and other “small market” teams) get screwed over by the fabulous marketing team at Topps. The bias shown towards certain teams, especially the Yankees, has reached the point that I can no longer just keep shelling out money to Topps. I feel that we have exhausted almost all of the pre-2008 products to the point that I’d just be re-hashing old products. 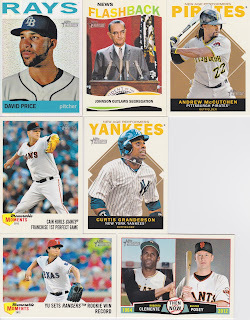 Additionally, companies like Fleer and Upper Deck are either gone or no longer honoring the redemptions in their products so that cheapens a non-Topps break even further. The last couple months of selecting products for the breaks has been stressful, and it shouldn’t be.Overall, I will be taking a step back from the hobby. 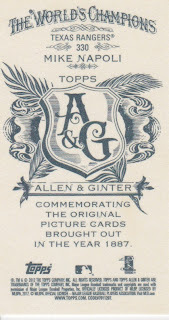 I originally took a break from the age of 16 until 28, when Allen & Ginter caught my eye and I found the joy I once had in building a set and collating cards. 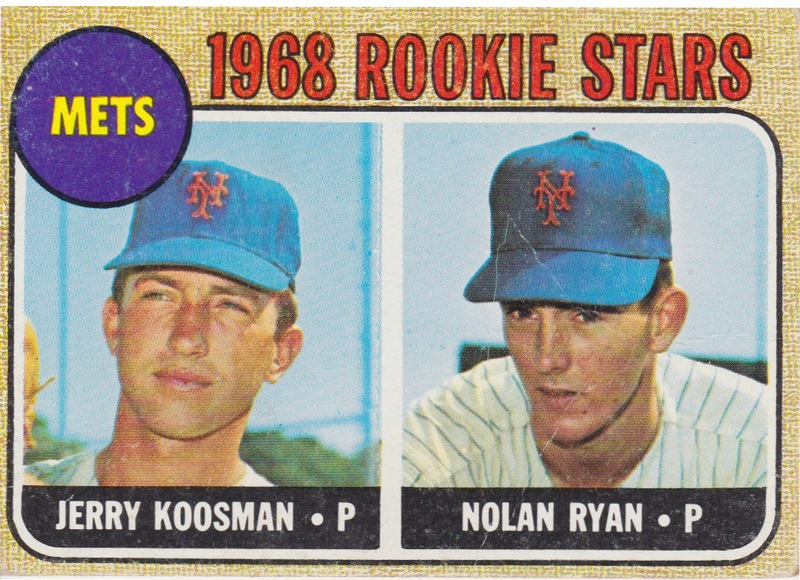 Even so, Topps has bastardized this set and turned it into something unrecognizable from its original form. 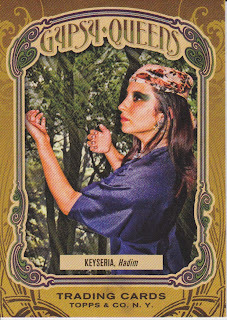 Gypsy Queen captured my interest in 2011 and I am still working on putting parts of that set together, and I will continue. 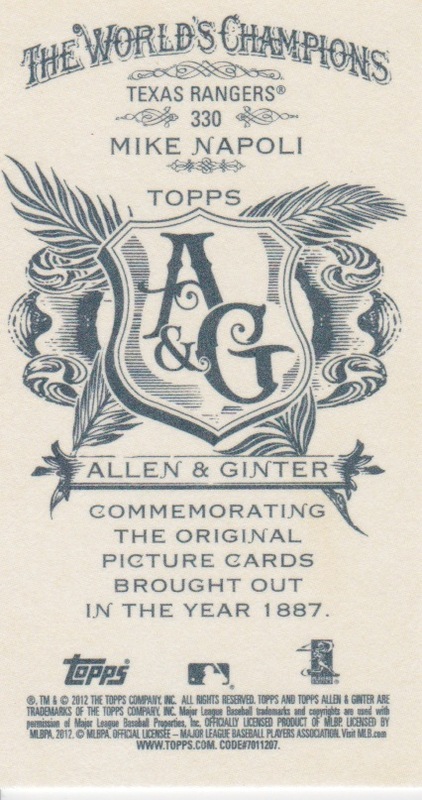 Topps took GQ and bastardized it the next year by overproducing it. 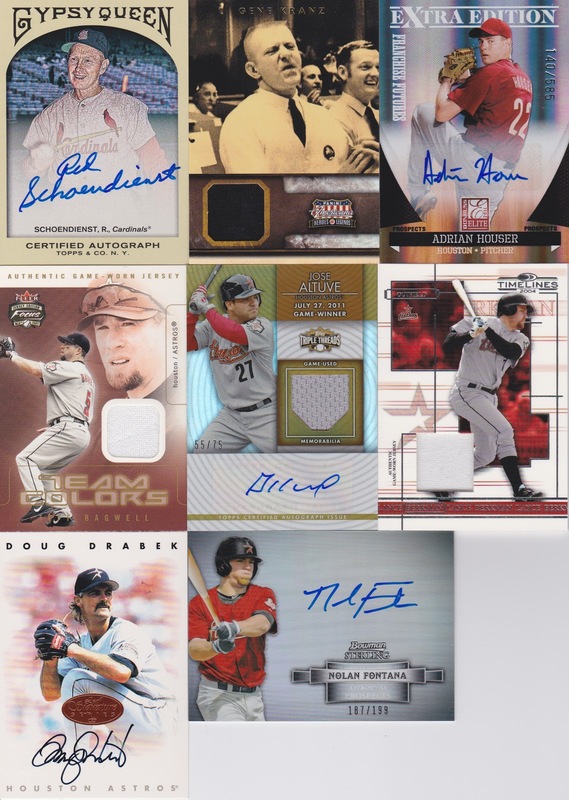 Looking at the checklist for this year, with 70+ each of autos, relics and mini-relics and about 4 kinds of short prints/variations… they’ve done it again. In some of the preview images of the 2013 set, I’ve noticed that in a set based on drawn images (not stock photography), they are re-using the same images from last year’s set! How lazy can you be? “Hey guys: just slap a new border on this and those dumb collectors will never notice!!! !” I’m bitter, yes, very bitter. I hate what Topps has done to degrade the hobby experience. Am I going to stop collecting? No. But I am going to be changing the way in which I collect. 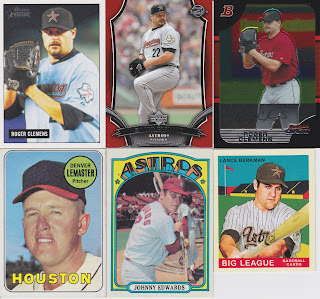 For those of you with COMC portfolios, expect to see more and more of your Astros cards sell from those portfolios. For those of you with Astros cards sitting out on eBay, expect to see them get sold. Local card shops, you’ll be seeing me in there more often sorting through boxes and selecting what I want. I’m going to collect smarter. Hobby boxes for $100, with 3 guaranteed hits and a snow cone’s chance in hell of something I actually want in my collection? No more. My LCS is not going to be too happy with my lack of spending at trade night, but it’ll be focused on seeing what others pull and have available for sale/trade. 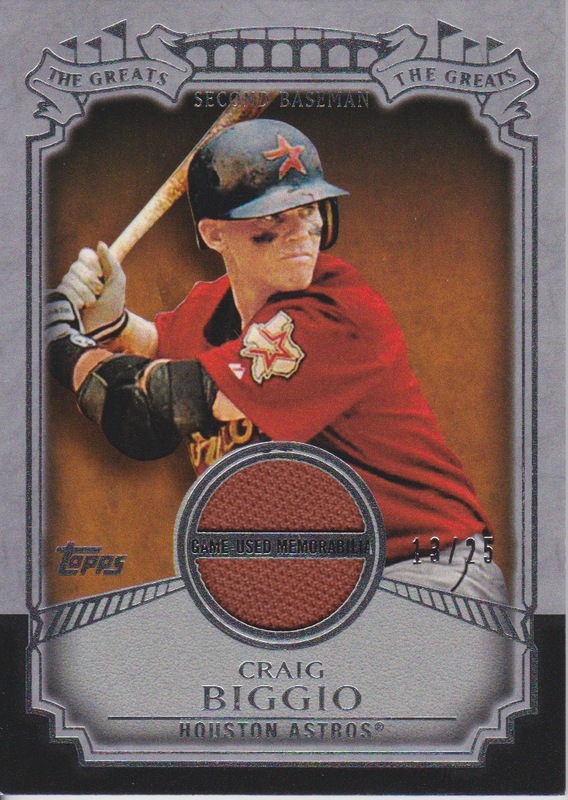 I may still gamble on a high end pack like Triple Threads from time to time, or pick up a lot of trade bait off eBay for the sake of facilitating trades with my readers but I won’t be pulling in 2-3 hobby boxes a month as I have for the past year plus here in Mobile . Call it sour grapes, call it burnout, whatever it is I’m tired of the feeling I have walking out of the card shop, it should be fun and it’s not as much fun for me anymore. As my wife, she saw my face last trade night after I completed a hobby box and felt all kinds of buyer’s remorse. For the loyal participants in the group breaks, you don’t know how much it means to me that you all put your money in my hands, and then watched those hands fondle all your cards. 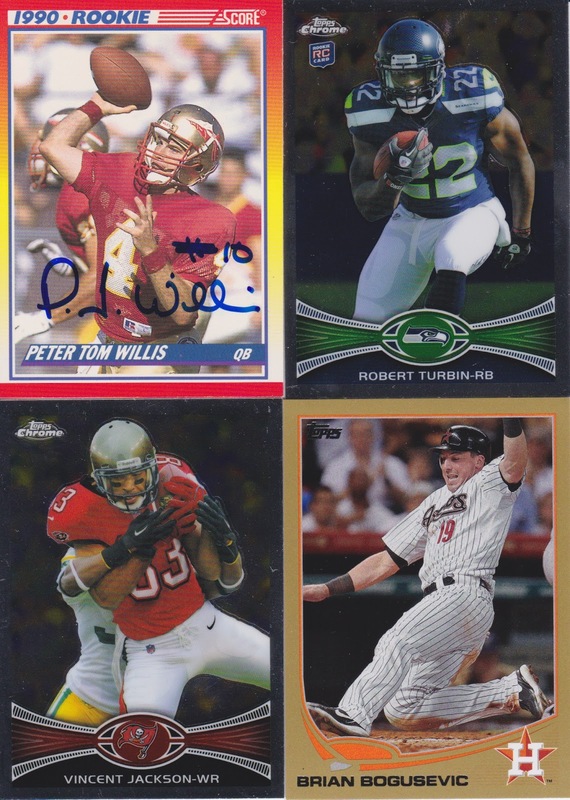 I was ecstatic to pull some awesome cards over the last couple of years. The 1/1 Gallardo bat knob coming to mind as one of our best pulls. I loved seeing the excited comments of those who got a hit or card that they were genuinely happy about receiving, cards that I knew would go into a personal collection. I was happy to see cards end up in the hands of guys and girls like myself, who just wanted great cards of players and teams that they collect. I generally feel that all the participants from my breaks enjoyed the breaks, and I tried to be as accommodating as possible. I know I never really busted any of the crazy stuff out there like National Treasure but I like to think I picked stuff that the general audience would want to bust. I hope you have enjoyed the ride. I’ve done my fair share of moaning and complaining. 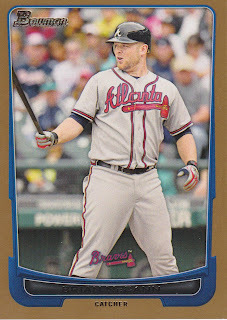 Topps just doesn’t respond to my twitter rants any more, and probably rightfully so. As an Astros fan, I don’t matter to them. My pockets aren’t as deep as those fans of major market teams. Topps won’t even notice the lack of my money in their coffers, because realistically whatever I don’t buy will just end up being ripped by some other guy out there. But as I mentioned above, COMC and eBay sellers will start seeing more from me. Change is a good thing, and change is coming to this blog. It will probably mean less frequent posts, but hopefully higher quality. Thanks for those who actually read all this, I love the community we have here online. I wouldn't trade it for anything. I will still be active and still be reading. Not going anywhere! 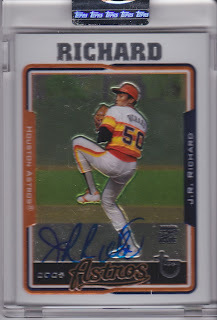 Hey everyone, I sent an e-mail to all group break participants in the 2013 Gypsy Queen Case Break asking for some basic info. If you could please double check your e-mail and let me know if you did not get an e-mail from me, I'll resend if you'll provide me with a valid e-mail link. My email: samuelpair@yahoo.com. If you did get the e-mail from me, please just read it through and respond so I can record your answer! There is only 1 team left in the break! Miami Marlins for $15 as of today. So, if you want the Marlins hurry up and claim them! The price will drop to $10 on April 1st and if they aren't claimed by the GQ release date then I'll keep 'em! 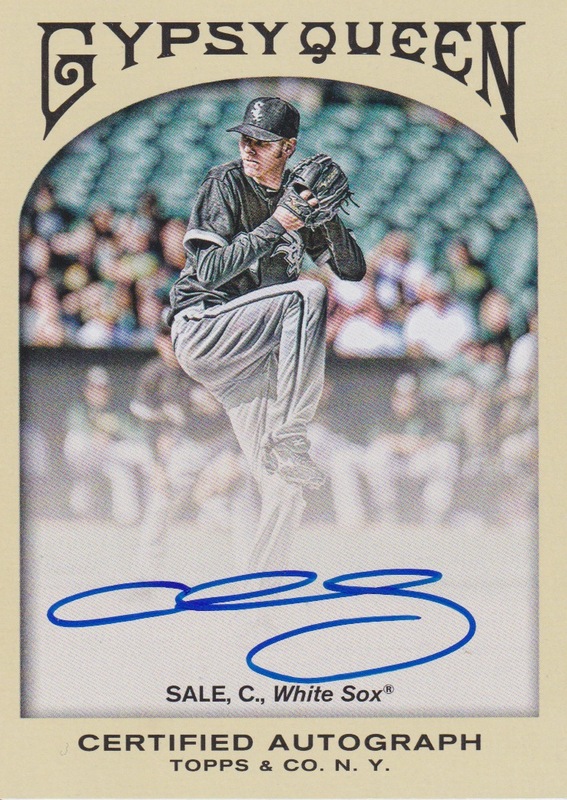 It's numbered /25... 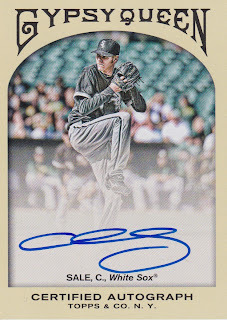 I just wish it was a better subject, it's a sweet looking card. I'm still due one more redemption from them. 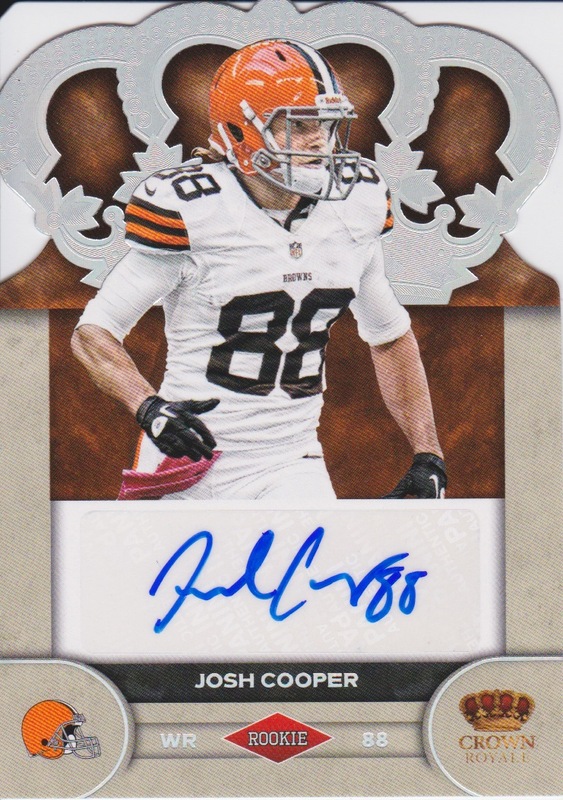 I was hoping this one and the one I'm owed would go unfulfilled so I could trade them in for a Texans card or two, but Josh Cooper had to go signing stickers! COMC has really upped their game since the latest re-design of their site and reformat of their shipping policy. It makes it a lot easier to get the bulk of cards that you want without paying out the nose on shipping. They have provided me absolutely no compensation for saying this, I just love the site. 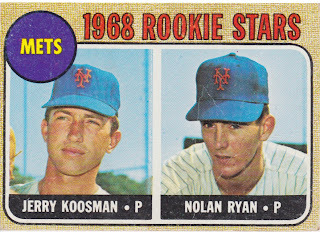 Today I have a bit of a tribute to pitching, the Nolan and Sandy kind of pitching: strikeouts and no-hitters! 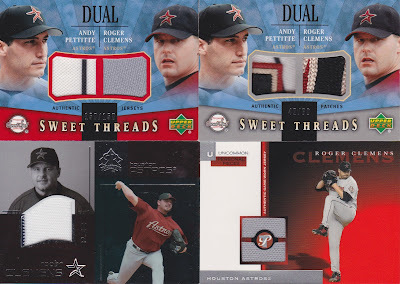 What an awesome dual relic of Oswalt and Nolan Ryan. Great card! 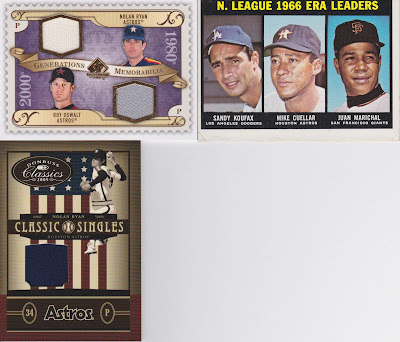 The Classic Singles has a nice dark blue swatch from Nolan's Astros days and I couldn't be more happy with it. 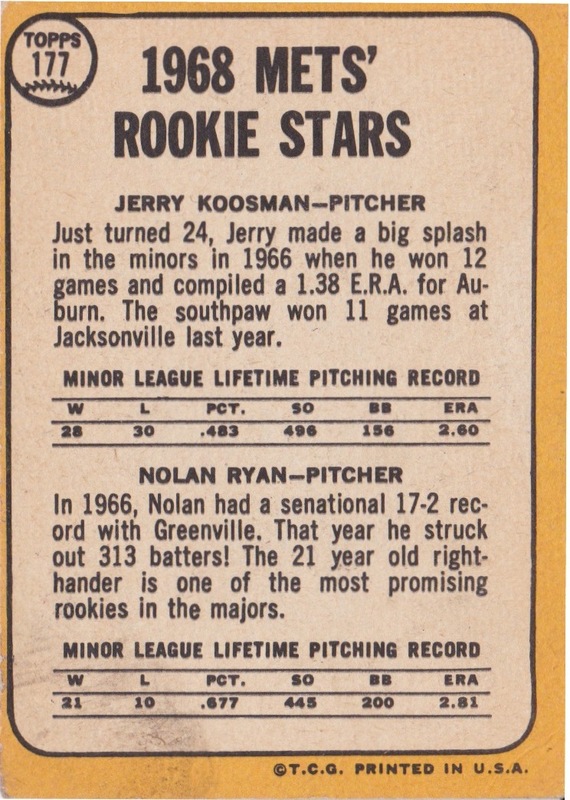 Surprisingly, this is my first "vintage" Sandy Koufax card. No, the condition isn't perfect but then again I'm not one of those guys who gets all up-tight about condition when it comes to vintage, in fact I'm more of a fan of the vintage card that has been shown a little love. 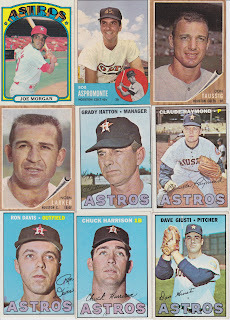 This will go in my Astros vintage binder since Cuellar is #2 in ERA on this card, but the real star of this card to me is Koufax. I'll wrap these posts up tomorrow with a couple of awesome cards of lesser known Astros... oh wait, all Astros are lesser known... haha! The two Sterlings are even more awesome in person and each numbered /199. Sweet lookin' cards! The only thing I'd change about the Stellar Stat Men would be the picture, it's too grey-scale, you can barely see it. 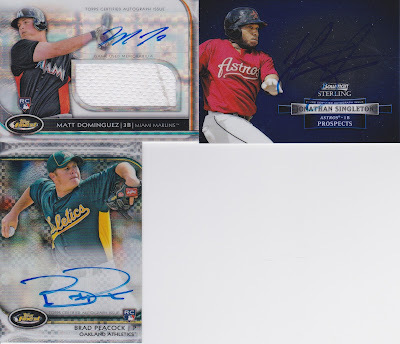 A great 4-some of cards! The card on the left is a trifecta! Rookie, auto and jersey! Had to pick it up on the cheap! On the right, we have the aptly named "Awesome Artifacts" set card of Morgan with a huge pinstriped swatch of jersey. Numbered /45, from my experience these are one per case. 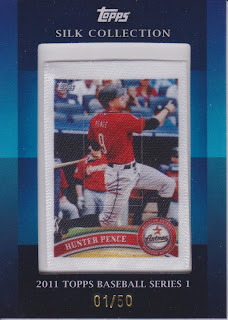 Pretty cool card and I was very happy with the final price I paid on it. Tomorrow we'll take a look at some Astros first-basemen. Have a great Sunday everyone! Ok, so I showed off some basic Topps inserts yesterday... today you get 2011 Gypsy Queen! Three more autographs to add to my collection. I have found a semi-official checklist of 43 autographs. 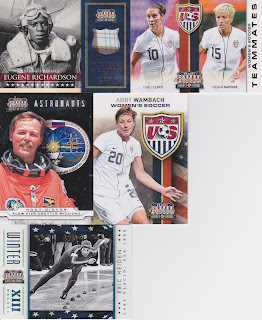 It encompasses all the ones that I've seen or know are in the set distribution. So with these three (plus the one at the end of this post, I am up to 27 out of 43. Not too shabby, picked each of these up for under $5 each. 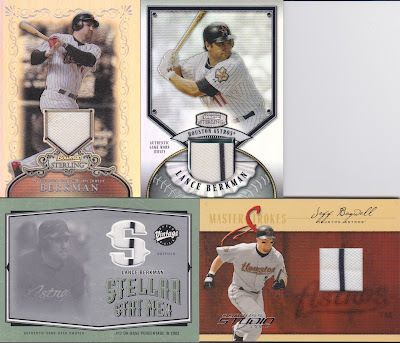 Next, one of the inserts I'm still chasing... 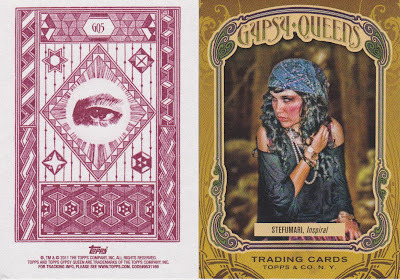 I only have one more "regular" back Queen to get, and a handful of the "Tarot Back" inserts as well. 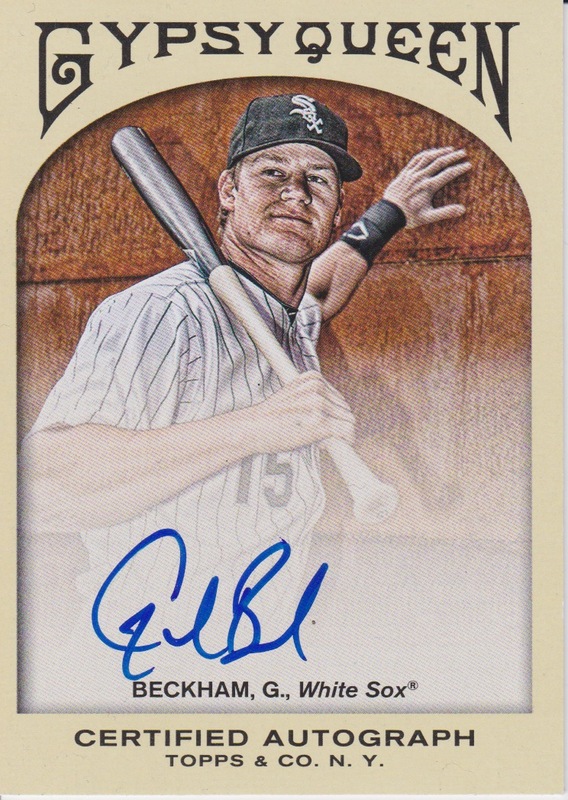 This wasn't part of my COMC purchase, but it is a GQ auto I needed! This was an eBay pick up and for the price I paid, I wish I had bought it a year and a half ago when Sale was still a relative unknown. Oh well, I am glad I have it in my collection now! I am a space nerd, as evidenced by my Gene Kranz auto/relic. 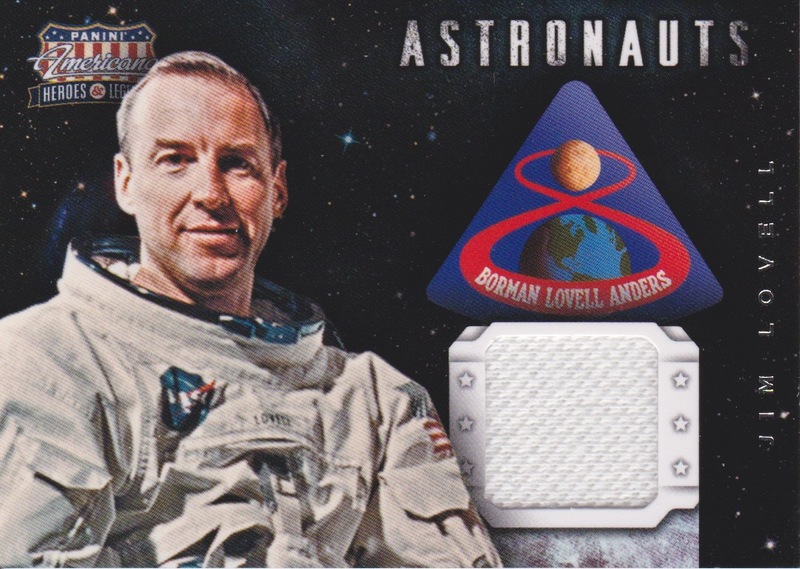 Jim Lovell is awesome, the guy who piloted the crippled Apollo 13 capsule back to Earth, and sadly the guy who never made it to the moon. This is an instant keeper in my collection! 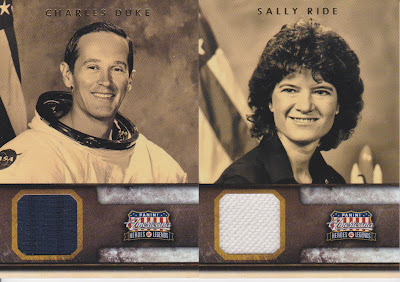 I love these astronaut relics. The one thing I wish Panini did was explain if this was a space program related piece of fabric or if it was just a piece of clothing worn by Jim Lovell. Either way, it's cool to me! 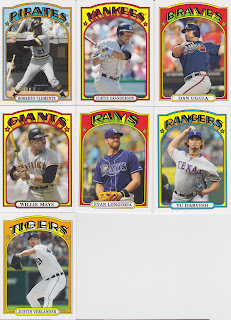 A Little Series Known As "No, You Check Out MY Cards"
So, I have been putting more and more money into COMC.com as I find it to be basically a clearinghouse of cards that I want at prices I'm willing to pay without the haggling or bidding process known as eBay. 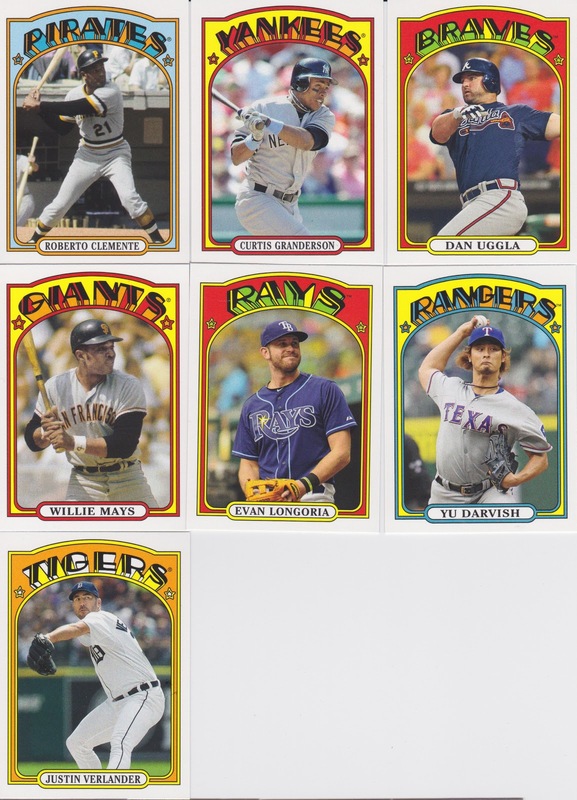 I got a shipment in yesterday and I'll be showing it off in various stages... today's group of cards: 2013 Topps Inserts. 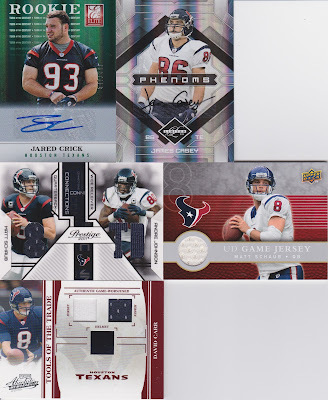 Got the die-cuts and "The Greats" inserts a lot cheaper than I thought I would. The Rasmus was a throw in when I got down to having very little money left. Not too shabby. 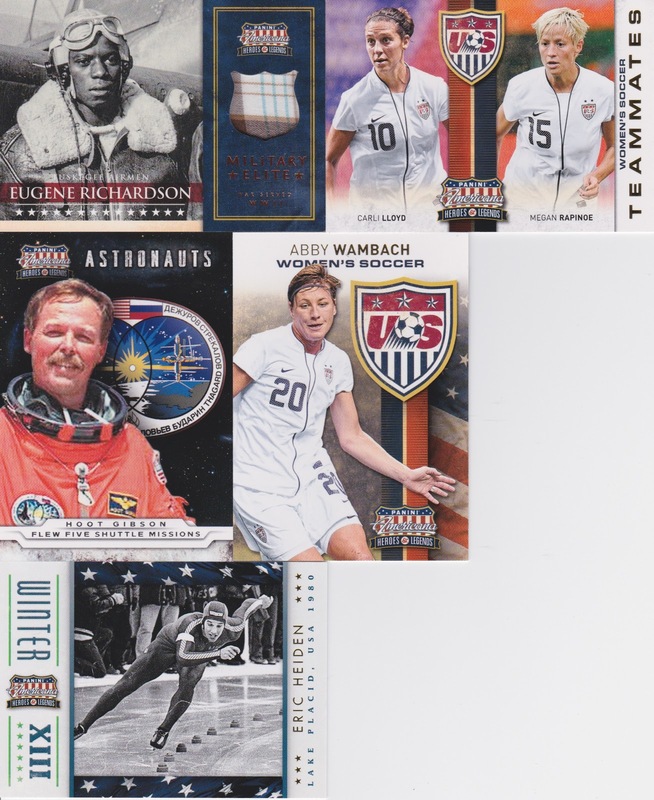 This "The Greats" set is going to be a pain to piece together, since they were such difficult hobby pulls to begin with. 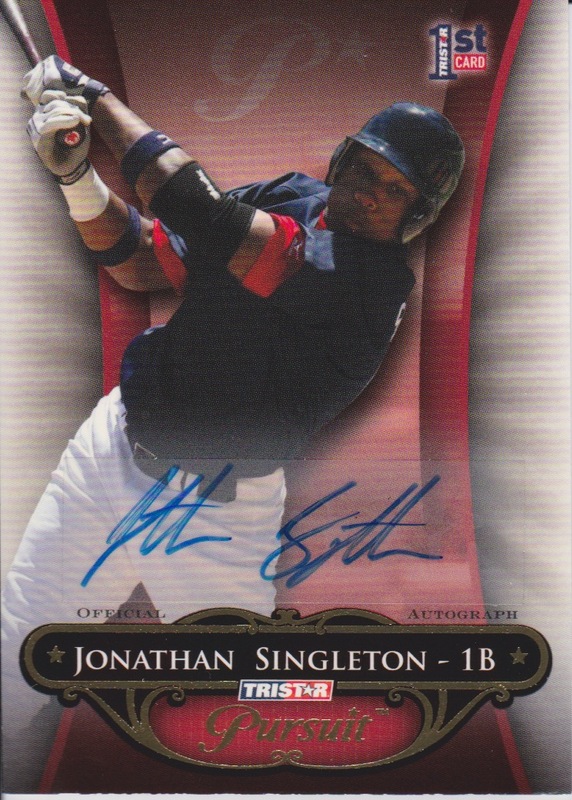 Speaking of "The Greats" insert set, I pulled off an eBay auction win the other day for a relic card from this insert, where the subject doesn't actually have a card in the insert set. 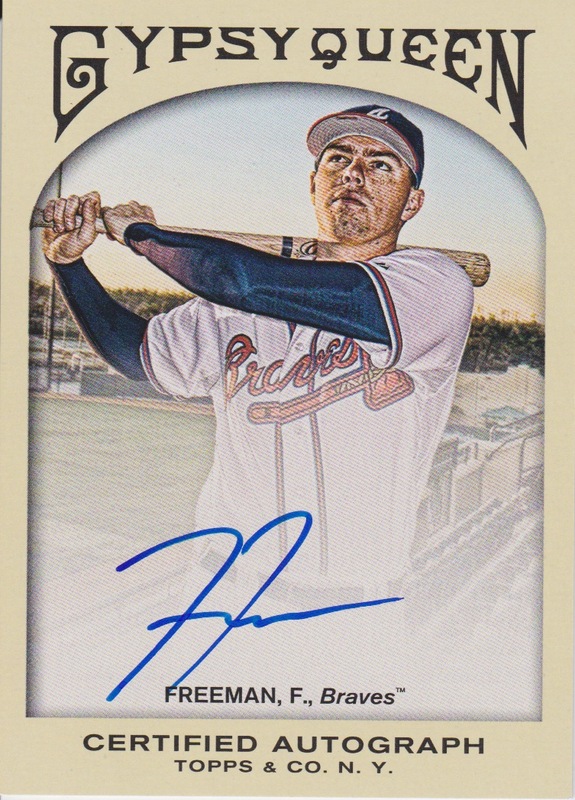 Imagine that Topps! How about you make the relic set a parallel of the insert set and vice versa... geez... alright, here's the glorious card I procured! I probably over-paid for it, but it's a nice looking card for sure! Wow, lots of movie poster relics. The vibrant blue swatches you see are all Grace Kelly, not a bad haul. She's featured on dual relics with Cary Grant and Gary Cooper, not bad company either; all numbered out of 499. 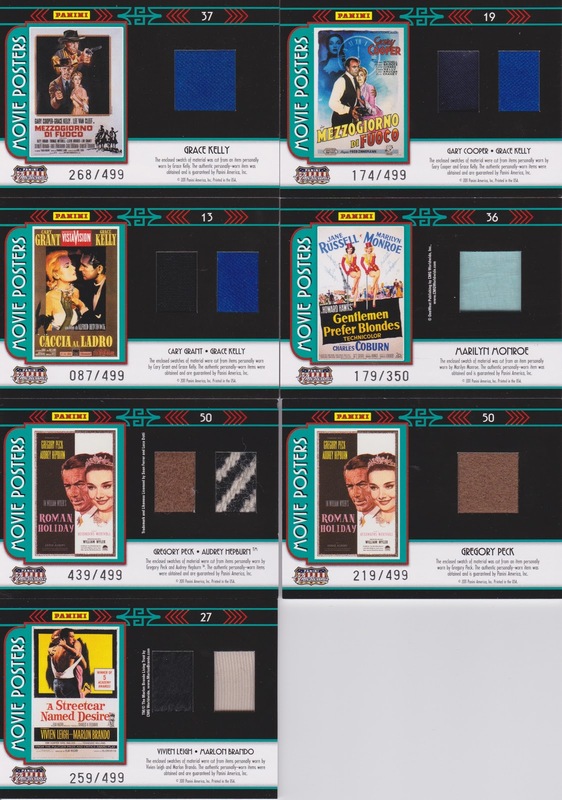 The pale green swatch is the one and only Marilyn Monroe, hers is numbered out of just 350! 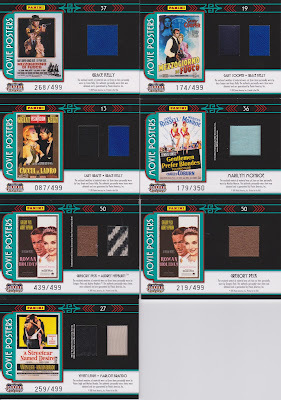 Next up, two Gregory Peck brown swatches, with the dual relic being with Audrey Hepburn. Finally, a highlight since she's such a Gone With The Wind fan, a Vivian Leigh dual relic with Marlon Brando! Nice! 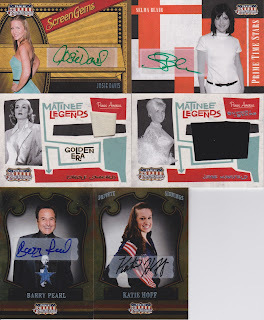 Josie Davie and Selma Blair autos, not too shaby, the Matinee Legends are VERY nice especially since they are numbered /49 and /25 respectively. Who the hell is Barry Pearl? And Katie Hoff rounds out the autographs out of these boxes. She really loved opening this stuff, if anyone has spare movie poster relics for trade, let me know as she'd love to get more! Crick was a rookie and got valuable experience down the stretch due to some injuries. Casey is a Rice product who is a hybrid FB/TE and who I really hope the Texans re-sign this off-season. 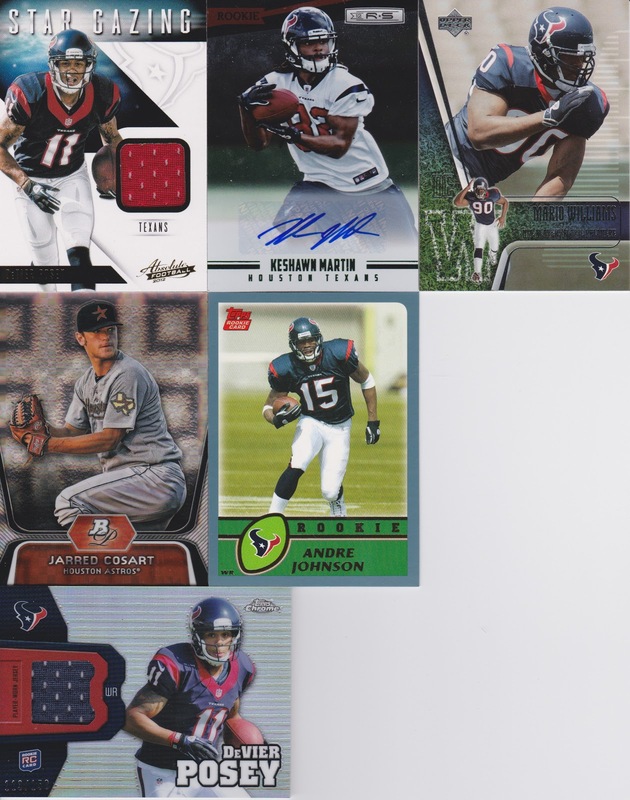 I asked for the Schaub/Johnson card because they are the best QB-WR combo I think Houston will see for a VERY long time. This is my first Schaub single relic as well. Finally, I feel I need to justify picking up the David Carr card. I have great memories of David Carr, mainly his first game as a Texan, the great defeat of "America's Team" (don't ask me, I didn't get a vote). I wanted to have at least one of his cards in my collection, and this one was pretty cool as it has not only 2 different jersey swatches, but also a cool piece of his game-used HELMET! How cool is that? Thanks for another great trade Matt! 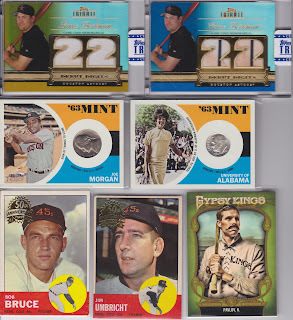 Hopefully I can restock on hockey and Cubs cards fast enough to get more again some time soon! Next up, Adam from My Cardboard Mistress. We had been trying to hammer out a deal for a long time... and finally he pulled something I could use!!!! 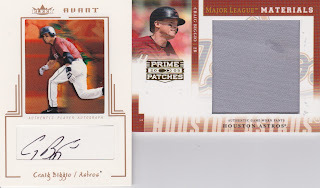 How about the elusive 2013 Astros hit????? 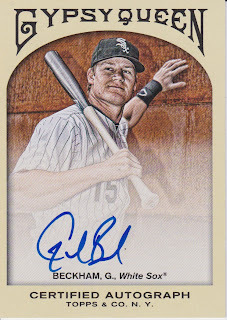 I stalked a few of these online before Adam pulled this beauty! He also sent along a bunch of Astros and a bunch of Texans... great stuff Adam, you're awesome. 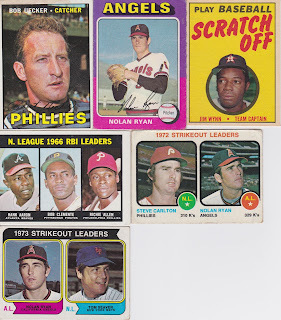 You get one guess per day, I will reply to your comment if you get 1 or 2 correct but I will not say which one you got correct, if you don't guess any correct, I won't leave a comment.. guess which three players' SP cards I got. The first commenter to put the pieces together and get all three will win the entire stack of cards from my blaster and 2 gravity feed packs that I bought (87 cards total). 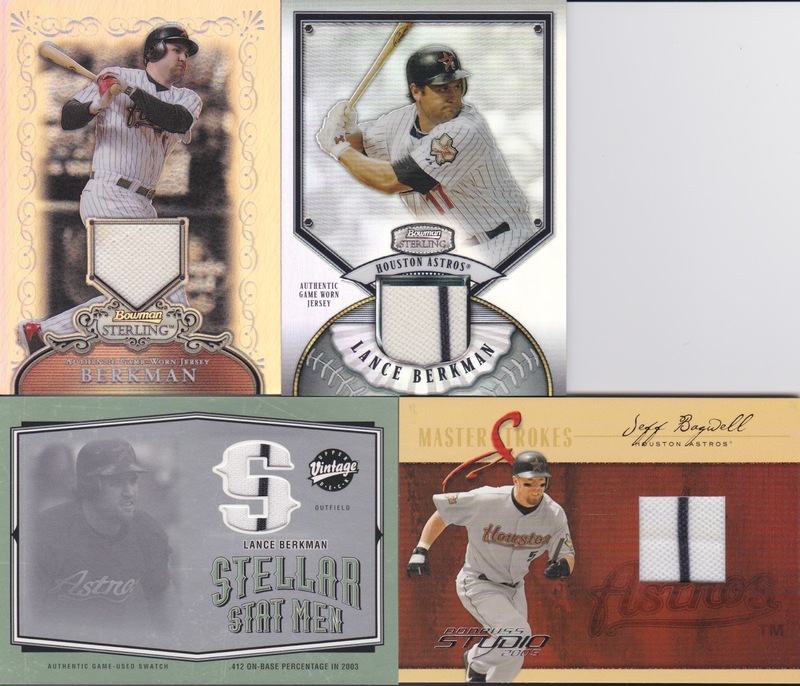 If no one guesses them all by next Friday, then I'll just keep these cards and use them as trade filler... have fun! Boxes are ordered and on the way. If you haven't made payment, please do so. One spot left for the taking! If no one claims it by Friday morning, I will take it. Thanks guys! 2005 - Topps Cracker Jack - Two Hits Per Box - Parallels and fun surprises! 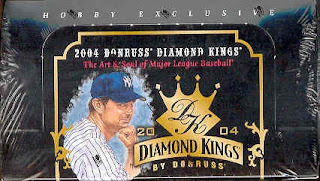 2004 Donruss Diamond Kings - Two More hits - this set is all about the artwork. 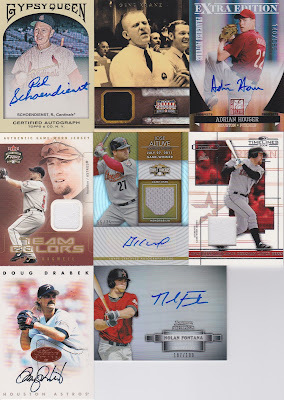 I am doing a bit of a smaller break this month, with the BIG Case Break coming up next month. 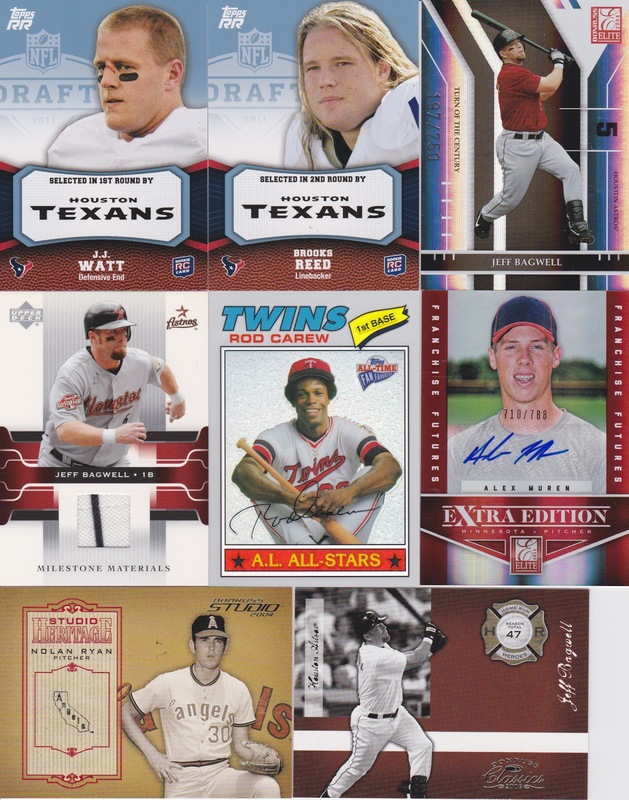 This will be the normal (2) teams for $15 - one your pick, the second randomized. Normal rules apply for team claiming: Leave a comment on this post. Once 15 slots are full, I will randomize the second teams. Any teams that have moved will go to the current incarnation. All multi-player base cards will be randomized among the teams on the card.